Here is what they wrote before it was open. As usual for these big projects the dates got moved back, it was properly open from May 1st. 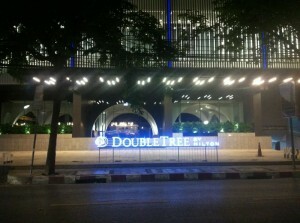 Hilton Worldwide will open its first Doubletree property in Bangkok any moment now, along with a new-build Hilton hotel. 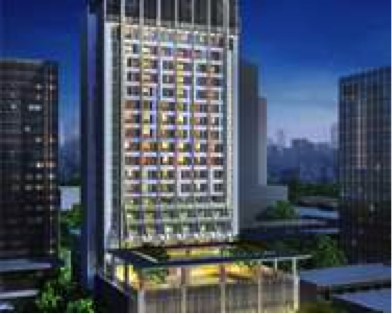 Both properties will be located in the commercial district of Sukhumvit, close to Phrom Phong sky train station and next to the Emporium shopping complex. The converted Doubletree by Hilton, Sukhumvit Bangkok will be the first property by the brand in the Thai capital, and will feature 182 rooms, an all-day dining restaurant, an outdoor swimming pool, fitness centre, and a 512sqm conference room. Latest photo! Love the lights. We might have to give customers dark glasses. No problem, we will all look cool.